According to the police report, a woman trying to cross Reston Parkway at South Lakes Drive was killed by a person driving a car on Thursday, Feb. 23 around 6:20 p.m. The speed limit on Reston Parkway in this very residential area is 45 mph. According to the Fairfax County Comprehensive Plan, 2013 Edition Area III Reston, Amended through 10-20-2015, Reston Parkway should have a speed limit of 30-35 mph in the Transit Station Area (TSA). 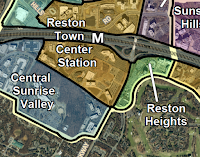 As you can see from the map, one of the TSAs along Reston Parkway extends to South Lakes Drive. As noted in the Post article in today's paper, As traffic deaths soar, cities pursue lower speed limits to eliminate fatalities, speed kills. 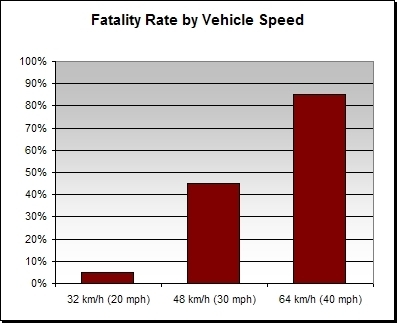 In order to achieve a vision of zero traffic deaths, motorists need to slow down. Unlike several other jurisdictions in the area, Fairfax County has yet to take the Vision Zero pledge. We hope they soon will. We plan to ask Supervisor Hudgins when the speed limit on Reston Parkway will be lowered to comply with the Comprehensive Plan for that area. 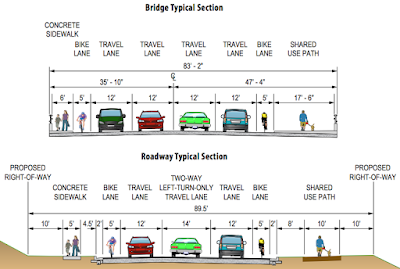 The design guidelines for street types should be followed when providing new private or public roadway connections or when proposing improvements to the existing roadway network in Reston. Reston Parkway is an example of a Minor Arterial-Type A in Reston, primarily carrying the longer-distance through traffic from adjacent areas such as the Town of Herndon and Loudoun County. A target posted speed of 30-35 miles per hour within the TSAs is desirable for Reston Parkway. Fairfax County is holding town hall meetings to allow citizens to learn about the proposed budget and a chance to tell your county representatives about your priorities. See the schedule below and on the county town hall meetings page. According to the County Executive Summary of the FY 2018 Advertised Budget Plan: "Significant capital investment requirements continue to be deferred, such as County and Parks infrastructure replacement and upgrades, revitalization maintenance, and trails and sidewalks." We encourage cyclists to attend one of these meetings and tell county reps that our trails are in very poor condition and we shouldn't ignore needed maintenance any longer. If you can't attend a meeting consider writing to your County Supervisor and Chairman Bulova, everyone's Supervisor. Update Feb. 28, 2017 - The Board of Supervisors unanimously approved the funding proposal, including the bike facilities on the Soapstone Connector, despite negative comments from Supervisor Herrity about the amount of space being devoted to pedestrians and bicyclists. Supervisor Herrity abstained. At their meeting on Tuesday, February 28 the Fairfax County Board of Supervisors will hold a public hearing on funding of transportation projects in Reston. Most of the road projects include facilities for bicyclists and pedestrians. Funding is also being sought to help create a grid of streets through the commercial areas around the Dulles Toll Road, including the Metro station areas, that will provide better on-road alternatives for bicyclists. FABB is not taking a position on the funding source or the worthiness of the various projects, several of which include widening already wide roads. However, if the projects are built, they must contain safe bicycle and pedestrian facilities. 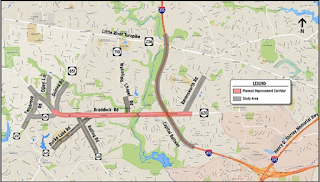 The public hearing will be held at the Board Auditorium, 12000 Government Center Parkway, Fairfax, sometime after 4:30 p.m.
One of the major projects is the Soapstone Connector, an extension of Soapstone Dr north across the Toll Road to Sunset Hills Road. This would also extend the bike lanes along Soapstone Dr to provide better access across the Toll Road and to the Reston Town Center and Wiehle Metro stations. There is some opposition to the bike lanes on the bridge. Cyclists are encouraged to attend the public hearing to testify in support of bike facilities as part of these projects. In the past it was all too common that bike and pedestrian facilities were eliminated or reduced in order to save money (Route 28). The Board and staff have a long-term transportation vision that includes safe, connected bike facilities but they need your support. If you can't attend the hearing you can contact Supervisor Hudgins to tell her you support bike facilities as part of these projects. 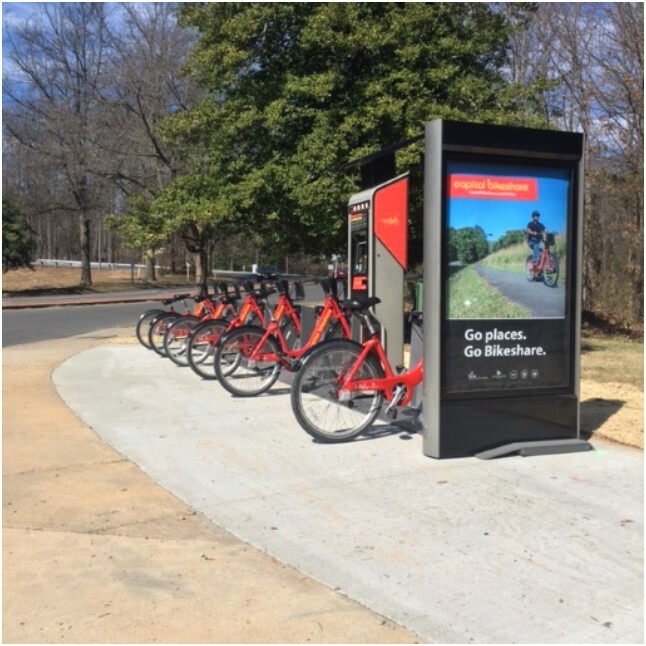 A bike share station was recently installed at the intersection of North Shore Dr and Village Dr, across from Lake Anne Village Center in Reston. Along with the nearby station at the entrance to Crescent Apartments, there are now two bikeshare stations in the Lake Anne area and a total of 12 stations in Reston. Fifteen stations are planned for Reston. Capital Bikeshare publishes a map of all Metro DC bikeshare stations that shows the location of each station along with an icon indicating the number of bikes available. See the Fairfax County page Bikeshare Launches in Reston and Tysons; Here’s How it Works for more info about the system. Below is an update based on the latest Virginia Bicycling Federation's reports on bills that could affect bicyclists in the 2017 Va legislative session. Bills that have failed indicated by strikethrough. SB 860 Use of handheld personal communications devices while driving; penalty. Would prohibit usage of handheld personal communication devices while driving. Filed by Sen. Surovell. Update 19 Jan - Failed by a vote of 7-6 along party lines, with Republicans all voting against. SB 1207 Electric personal delivery devices. Allows for the operation of electric personal delivery devices on the sidewalks and shared-use paths and across roadways on crosswalks in the Commonwealth unless otherwise prohibited by a locality. The bill directs that such devices shall not be considered vehicles and are exempt from the motor carrier provisions of Title 46.2 (Motor Vehicles). Filed by Sen. DeSteph. Update 26 Jan - Passed Senate Transportation Subcommittee 12-0. Update 22 Feb - Passed both Home and Senate. Awaiting signature by Governor who made a suggested change that was sent back to the Senate. SB 1223 Riding bicycle, electric personal assistive mobility device, etc., while intoxicated; penalty, making it a Class 2 Misdemeanor to ride a bicycle, SegWay, moped, or electric power assisted bicycle on a highway while intoxicated. Filed by Sen. Baker. Update 19 Jan - An additional bill being watched by VBF. Update 25 Jan - Failed by a vote of 7-6 along party lines, with Republicans all voting against. SB 1338 Bicycle lane; penalty for driver to pass another vehicle using lane. Filed by Sen. Surovell. Bill number added. Update 25 Jan - Amended bill passes Senate Transportation Subcommittee 8-5. Update 22 Feb - Passed by full Senate 22-18. Failed to pass House Transportation Subcommittee 3-4. SB 1339 Careless driving; cause of injury to vulnerable road user. Filed by Sen. Surovell. Update 25 Jan - Heavily amended (reduced penalties) bill passes Senate Transportation Subcommittee 9-4. Update 22 Feb - Passed Senate 21-19. Failed to pass House Criminal Law Subcommittee by voice vote. Subcommittee recommends reporting with substitute (9-Y 1-N). Update 22 Feb - HB 1504 Passed Senate 40-0, signed by Governor. HB 1514 Passed House 95-0, passed Senate 37-3. HB1633 Careless driving; cause of injury to vulnerable road user. which creates a lower criminality threshold and higher penalties for drivers who injure pedestrians and cyclists. Filed by Del. Rip Sullivan and co-sponsored by Del. Jim LeMunyon. Update 22 Feb - Failed to pass House Criminal Law Subcommittee by voice vote. HB 1834 Distracted driving; penalty. Adds a “Distracted Driving” offense to the section of the Code that prohibits Reckless Driving (46.2-868). This will add a lesser infraction to the code for infractions that are not as severe as to warrant “Reckless Driving” which has traditionally been considered a very severe charge in this state. Filed by Del. Anderson. Update 25 Jan - Being re-written. Update 22 Feb - Passed Criminal Law Subcommittee 11-0, Failed to pass Courts of Justice Committee 9-10 (apparently someone switched their vote from Y to N when the bill moved from the subcommittee to the committee). HB 2016 Electric personal delivery devices; operation on sidewalks and shared-use paths. This bill anticipates having wheeled drones delivering merchandise in the future. Filed by Del. Villanueva. Update 22 Feb - Passed House 97-0, passed Senate 40-0. Amended in Senate. HB 2023 Highway maintenance payments; bicycle lanes. The bill to not reduce highway maintenance payments to municipalities that have implemented road diets. Filed by Del. Villanueva. Update 19 Jan - Reported out of Transportation Committee 22-0. Update 22 Feb - Passed House 97-0, passed Senate 40-0. Enforcing Virginia's three-foot passing law can be difficult. When cyclists complain to police about problems like motorists passing them too closely, the usual response is that there's nothing they can do. Unless an officer sees the infraction, the only evidence is usually the cyclists' word versus the motorists'. Having video footage can help but often cameras on bikes are only mounted on either the rear or front, missing potentially useful viewpoints. Despite what many police say, even without video of the event it is possible to report the incident. See FABB's How to Report an Aggressive/Reckless Driver info. In September 2016, the West Midlands Police force, the UK’s second largest, launched Operation Close Pass. Initiated by officers concerned with the safety of cyclists, its purpose was to address unsafe overtakes and passing distances by motorists. Using Cycliq's Fly6 and Fly12 all-in-one bike cameras and safety lights, officers recorded drivers from an on-bike viewpoint. Operation Close Pass was praised by cyclists and media alike and attracted a lot of attention in the national press. Afterwards, The Road Danger Reduction Forum also gave an award to the West Midlands Police for 'Give Space, Be Safe'. More importantly, there was an immediate impact on local drivers as can be read on the West Midlands Police’s own 'Behind the badge' blog. Equipped with Fly6 and Fly12, one team of officers rode around traffic hot-spots and informed their close-by patrol car colleagues by radio of any infractions. Offending drivers were pulled over and offered the option of formal proceedings; namely a fine or, dependent on the severity of the offense, a road-side education on the vulnerability of cyclists and road rules. "Within a week cyclists were contacting us to tell us things had had not only improved, but improved considerably. There were still close passes, always will be, 'can’t get them all', but they have become a rarity rather than commonplace." says PC Chris Brock. This change in driver's behaviour around cyclists just shows that raising awareness for safe passing distances can have a significant impact. Overall, the response from offenders was very positive. This campaign did not have the intent to prosecute as many drivers as possible, but rather educate them. Awareness is necessary to be able to assess the situation around cyclists and then decide on safe overtakes. Only 1% of the offenders were actually given 'Traffic Process Reports', and quite often this was due to other violations (i.e. on the phone while driving, driving without insurance, and oh, the lady putting her dog back in its cage). We understand that in addition to WMP, now the Greater Manchester, Somerset & Avon, Scottish and North Wales police stations all have Cycliq products to assist them with helping to make the roads safer for everyone. In addition, more police forces are looking to introducing the close pass scheme as can be read on Cycling Weekly. In fact, the Greater Manchester Police force has just launched their own Close Pass initiative. VTrans is the Virginia statewide multimodal transportation plan. The Draft 2025 Plan contains project-level recommendations. See the NoVa District recommendations. Comments are being solicited on these recommendations until March 10. We have not had the time to delve into the recommendations in detail and would appreciate any help in reviewing the document and developing comments. The movement of people and goods is important for Virginia’s vitality and competitiveness. As we plan for a pipeline of short-range improvements to 2025, we are also scenario planning for 2040. We need to understand your ideas and concerns regarding transportation planning across our state. FCDOT's community meeting on Braeburn Drive is this Thursday, February 23, from 6:30 to 8 p.m., at Little Run Elementary School, 4511 Olley Lane, Fairfax. 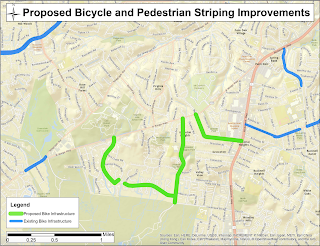 If you live or ride in the Braddock district, FABB encourages you to attend and add your support for plans to add bike lanes as part of VDOT's summer road repaving program. New bike lanes are being planned for Braeburn Drive from Guinea Road to Olley Lane. Northern Virginia Transportation Alliance claims to promote multi-modal transportation in the region. While their vision of multi-modal transportation does include transit, the group primarily promotes expanding existing roads and developing major new roads such as the Bi-County and Tri-County Parkways, a new bridge across the Potomac north of the American Legion Bridge, and others. Over half of their Board of Directors consists of representatives from major engineering/land development companies and major land use development legal firms. At Wednesday's meeting of the regional transportation coordinating group, the Transportation Planning Board, NVT Alliance (to distinguish it from the NVT Authority), testified that the TPB should only focus on reducing congestion in their Long Range Plan, and that "land use, bicycle trails and sidewalks all play a role, but that all are local responsibilities." I guess NVT Alliance has never heard of the W&OD Trail, the Mt Vernon Trail or any other regional trail networks. Or regional bike share. Reston and Tysons bikeshare, part of the regional Capital Bikeshare system, was made possible by a grant from TPB. And the cost of bike and ped improvements is minuscule compared to the cost of major road projects. It's ironic that NVTA began their remarks by stating the TPB needs to address the "core cause and that the longer the cause is ignored, the longer it will continue." Their solution is building more roads, when in fact, the cause of our congestion is poor land use planning that leads to sprawling communities where the only way to reach jobs, schools, and stores is to drive. Proper land use planning in transit-oriented, walkabale/bikeable communities is the solution. The Alliance frequently takes positions opposing funding for bicycle and pedestrian infrastructure. See previous FABB blog entries from 2009. We can understand that the development community wants more and bigger roads to allow more sprawling development, but the focus of development recently has been on more compressed developments around transit that allows residents opportunities to walk and bike and take transit to get around. It's time NVTA got with the program. 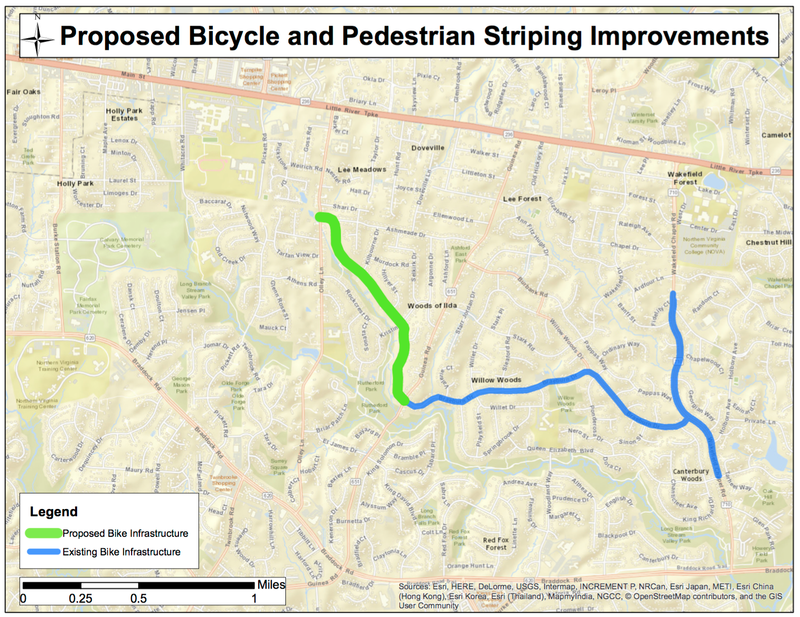 Braddock District and other interested FABB members and bicyclists are encouraged to a community meeting hosted by the Fairfax County Department of Transportation to discuss proposed bike lanes on Braeburn Drive. The meeting will be held on Thursday, Feb. 23, 6:30 to 8 p.m., at Little Run Elementary School, 4511 Olley Lane, Fairfax. Representatives from FCDOT and VDOT will present plans for the project, which includes bike lanes, pedestrian improvements and overall safety. Several bicycle projects are proposed as part of the Virginia Department of Transportation's (VDOT) summer road repaving program. New bike lanes are planned for Braeburn Drive from Guinea Road to Olley Lane, extending the existing connection from Wakefield Chapel Road. 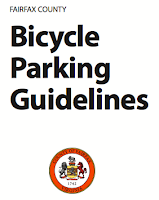 At their meeting yesterday the Fairfax County Board of Supervisors officially endorsed the county's Bicycle Parking Guidelines that have been in development for almost 10 years. Kudos to the Board, and to FCDOT staff for their work over the years developing the guidelines and working them through the approval process. FABB began advocating for these guidelines in 2007 when we met with Supervisor Smyth to discuss the importance of the county having guidelines for developers and others to implement safe, convenient bike parking. The guidelines will be applied to all new developments in the county. While existing developments are not required to install bike parking, they now have guidelines to use when bike parking is provided. Board of Supervisors endorsement of the Fairfax County Bicycle Parking Guidelines (Attachment I). The County Executive recommends that the Board endorse the Fairfax County Bicycle Parking Guidelines (Guidelines) to provide guidance to the development community on the number, type. and location of bicycle parking proposed with new development. Board action is requested on Febmary 14, 2017, to allow the recommendations in the Guidelines to be implemented expeditiously. Bicycle parking is needed for the County to meet its goals of encouraging multi-modal transportation as stated in the Comprehensive Plan. Residents who choose to bicycle need safe and secure locations to park when they visit friends and family, shop, and work. The type, quantity, and adequacy of bicycle parking that currently exists varies from location to location. The Guidelines will provide direction to facilitate adequate bicycle parking in all future development. In the Washington D C . metropolitan area. Arlington County's. the City of Alexandria’s, and the District of Columbia's zoning ordinances prescribe the required number of bicycle parking spaces in each of their zoning districts. The parking ratios suggested by the Guidelines were determined after researching these ordinances, as well as bicycle parking ratios and guidance from multiple jurisdictions around the country. Fairfax County Department of Transportation (FCDOT) staff presented information about the Guidelines to the Board Transportation Committee on May 19, 2015 (Attachment II). The presentation discussed the various sections of the document, what the process currently entails without these guidelines, and examples of how the document would be used to guide bicycle parking as a part of development. The Board instructed the Fairfax County Department of Transportation to conduct further public outreach with the development community to supplement its previous outreach with the bicycle community. I. Comment: Short term bicycle parking ratios for commercial development appear to be high (1 space/20,000 sq. ft.) and location guidance within the streetscape may not be feasible. Response: The FCDOT bicycle parking ratios were developed after a review of local and national jurisdictional bicycle parking rates, and are the same as Arlington County and the City of Alexandria. The guidance on bike rack location is the ideal siting, and may not always be possible. FCDOT understands the need to be flexible and work with developers on the design and location for bicycle parking. II. Comment: Long term parking ratio in urban activity centers and transit station areas (117,500 sq. ft.) is high and location guidance may be difficult to meet. Response: The FCDOT bicycle parking ratios were developed after a review of local and national jurisdictional bicycle parking rates, and are in line with these jurisdictions. The guidance on bike rack location is the ideal siting, and may not always be possible. FCDOT understands the need to be flexible and work with developers on the design and location for bicycle parking. III. Comment: Guidance on wayfinding and bicycle parking signs should be included in the document. Response: FCDOT added information about bicycle parking signage to the document. IV. Comment: Fairfax County might want to look into the alternative framework in line with LEED v4 BD&C bicycle facility credit criteria, which is based on the use and projected number of visitors to a building (with an example of a data center or server farm). Response: FCDOT selected to use the model many of the surrounding jurisdictions use and recommended by the Association of Pedestrian and Bicycle Professionals Bicycle Parking Guidelines, which identifies bicycle parking rates by building use and size. However, adjustments may be appropriate, depending on the building use. Adjustments can be discussed on a case by case basis. In addition to these specific comments, many stylistic comments were received and incorporated into the document. There is no fiscal impact to the County as a result of this endorsement. The weather forecast for Saturday looks great, sunny with a high of 66 degrees. You couldn't ask for a better start to the first Reston Kidical Mass ride. The Valentine-themed ride will be begin at Hunters Woods pool at 10 a.m. Saturday, Feb. 18. Wheel you be my Valentine?! 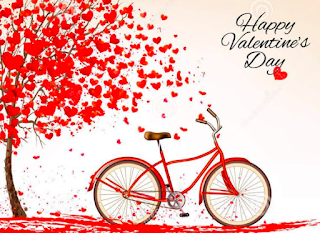 Join us for a special Valentine’s Day themed family-friendly bike ride. Before the ride we will decorate our bikes and helmets, and then head out for a short spin around the neighborhood trails. We will take a break at a playground and share some sweet treats! We are bringing together families who bike in an effort to provide a positive community experience that will show children how much fun riding your bike can be! Rides are very slow and we have a ride ‘sweeper’ who stays in the back of the group to make sure no one is left behind. Also, the ride leader will stop as many times as necessary to make sure the group stays together since it’s safer and more fun that way! Since we are not stopping traffic or blocking traffic this may mean it’s the slowest ride you’ll ever take- but it makes it more fun and festive! ​FABB has decided to hold its monthly meeting on Thursday, 16 February after the FCDOT community meeting on proposed bike facilities in the Lee District near Route 1. Please join us at the Groveton Elementary School cafeteria at 6900 Harrison Lane, Alexandria, from 6:30 to 8:30 p.m. for the FCDOT and FABB meetings. The FCDOT meeting begins at 6:30 p.m.
FABB intended to focus its February meeting agenda on developments in the Lee and Mt. Vernon Districts and was scheduled to meet at the Mt. Vernon Government Center on Wed. Feb. 14. As it happens, FCDOT scheduled a meeting on plans for bicycling improvements in Lee District the next evening. So, FABB’s Board decided the best use of our members’ time would be to focus on supporting the proposed bicycling infrastructure improvements. Our intention is to hold a quick membership meeting after the FCDOT meeting ends. We’ve done this type of thing in the past but generally don’t like to give up our monthly gatherings. We will return to our usual arrangements in March. Our general meeting will then be held on Wednesday, March 15, at the Oakton Public Library. FABB has been nominated by Clean Air Partners as a Most Valuable Partner. We've worked with Clean Air Partners in the past, using their Air Quality Forecast widget to notify cyclists about Code Red and Code Orange air quality warnings. They recognize that bicycling creates no air pollution and if more people biked it would have a positive impact on our regional air quality. 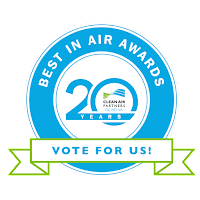 Please vote for FABB as a Most Valuable Clean Air Partner. Enter your email address under the FABB logo to vote. An email will be sent to ask you to confirm your vote. Clean Air Partners is a public-private partnership that educates the greater metropolitan Washington-Baltimore region about the health risks associated with poor air quality and the impacts everyday actions have on the environment. For 20 years, Clean Air Partners has helped individuals and organizations take simple actions to reduce their impact on the environment and exposure to air pollution during unhealthy air quality days. Clean Air Partners’ Air Quality App is a free resource that provides air quality forecasts and real-time health notification. For more information and to download the app, visit www.cleanairpartners.net. 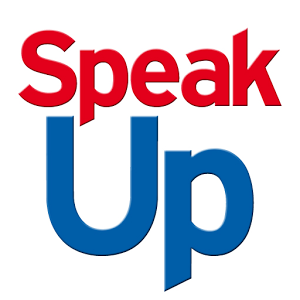 If you haven’t already added your voice in support of these proposed traffic safety, bicycling and pedestrian improvements in Annandale, please make sure to get your comments submitted by this Wednesday, February 17, 2017. FABB members in Braddock District are encouraged to send in comments on proposed improvements for the Braddock Road corridor, which are due by next Monday, February 20, 2017 (Presidents Day). To provide feedback, please use the comment form on the FCDOT pages for the Mason project or the Braddock Road project. You can mail comments to FCDOT Bicycle Programs, 4050 Legato Road, Suite 500, Fairfax, VA 22033. Another option is to call 703-877-5600 and leave a message. FABB is switching its monthly meeting in February from Wednesday, 15 February, to Thursday, 16 February, and is combining our meeting with an FCDOT community hearing that evening. Please join us at the Groveton Elementary School cafeteria at 6900 Harrison Lane, Alexandria, from 6:30 to 8:30 p.m. for the FCDOT and FABB meetings. An explanation: FABB had intended to focus its February meeting agenda on developments in the Lee and Mt. Vernon Districts and was scheduled to meet at the Mt. Vernon Government Center. As it happens, FCDOT scheduled a meeting on plans for bicycling improvements in Lee District the next evening. So, FABB’s Board decided the best use of our members’ time would be to focus on supporting the proposed bicycling infrastructure improvements. Our intention now is to hold a quick membership meeting after the FCDOT meeting ends. Please check out this StreetsBlog Denver article about the former Vancouver chief planner’s thoughts on improving transportation by emphasizing biking, walking, and transit over self-defeating efforts to widen roads. 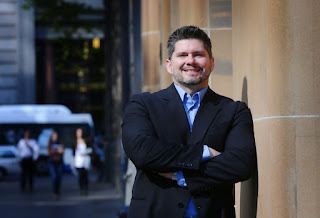 In a nutshell, Brent Toderian, speaking at the Bicycle Colorado' Moving People Forward conference this month, made the case for urban planning that foregoes trying to “balance” highway construction with other transit options. The result of this approach is to encourage car traffic and discourage the use of multimodal options. In Toderian’s view, “balancing modes” is code for not prioritizing walking, biking, and transit. But, if you design and build a multimodal city, it works better for everybody, including drivers. He also points out that if you want more people to ride bikes, don’t add bike lanes slowly. If there isn’t a complete network of bike lanes, fewer cyclists will use them. So, if you want to get serious about mode share for cycling, cities need a much faster and more robust approach to building separated, protected bike lanes. Toderian has some other interesting things about Vancouver’s and Denver’s examples, about financing transit, and about the importance of improving transportation for cities’ economic futures. Brent Toderian is a nationally and internationally respected practitioner and thought-leader with 24 years of experience in advanced urbanism, city planning and urban design. Check out his website UrbanWORKS. When should a bicyclist take the lane? How much room does a motorist need to give while passing a bicyclist? What are the rules for different users of shared-use paths? The rules of the road are not properly understood by many. The Northern Virginia Regional Commission recently published an updated educational guide that will help. 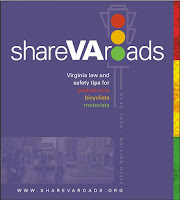 ShareVARoads: Laws and Safety Tips for Bicyclists, Pedestrians, & Motorists is an up-to-date guide to current laws and provides a wealth of useful tips for safe riding. There is also an online version of the guide, http://sharevaroads.org, that makes it easy to find specific information about the rules of the road right away. Volunteers from FABB, WABA, the Fairfax County Public Schools Safe Routes to School coordinator, VDOT and other agencies all contributed to the guide. English and Spanish PDF editions of the guide can be downloaded at the website. They are also available at the Sully Governmental Center on 4900 Stonecroft Boulevard in Chantilly. FCDOT will host a community meeting to discuss proposed bike lanes in the Lee District on Thursday, 16 February, from 6:30 to 8:30 p.m., in the cafeteria of Groveton Elementary School, 6900 Harrison Lane, Alexandria. Representatives from FCDOT and VDOT will present plans for the project, which includes bike lanes and pedestrian and overall safety improvements. The proposed new bike lanes for five roads in Lee District will be created during VDOT’s repaving and restriping of existing roads. FABB members and others interested in improving multimodal transportation options in Lee District should plan on attending this meeting to support these proposals. We are encouraged to see that bicycling is included as an integral part of Fairfax County's Draft Environmental Vision. You can support that vision, and supplement it if needed, by filling out a survey on the current vision language. We made suggestions about end-of-trip facilities for bicyclists, use of multimodal level of service, and better bicycle and pedestrian access to parks. 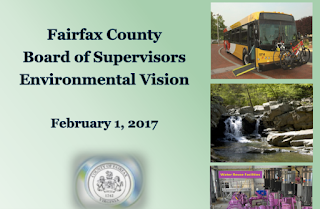 ONLINE SURVEY: Please let us know if you have suggestions for Fairfax County's environmental policies. This survey may take 10-20 minutes of your time, but your feedback will have a lasting impact for years to come. What we hear from residents will help shape our environmental policy language. 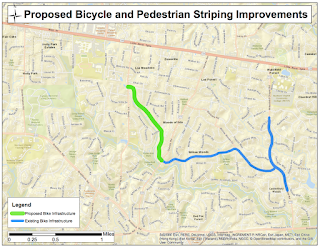 Tomorrow, Tuesday, Feb. 7 is the last day to comment on the proposal to stripe new bike facilities on Hillside Rd and Greeley Blvd near the Rolling Road/Old Keene Mill intersection. Comments can be made on the project comment form on the right side of the page. 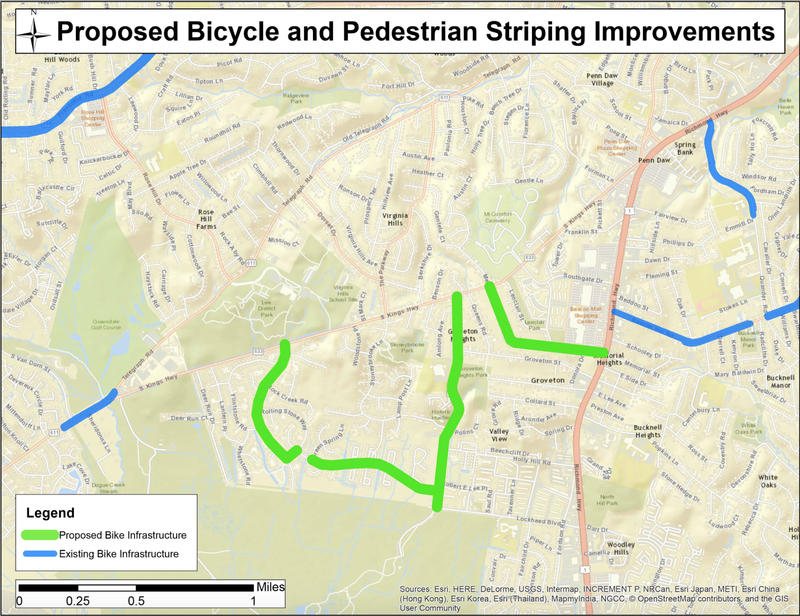 Fairfax County Department of Transportation (FCDOT) held a community meeting to discuss proposed striping changes in Springfield and Braddock Districts on Tuesday, January 24. The purpose of the meeting was to gather input on various proposals to improve traffic safety, bicycling and the pedestrian environment in Springfield. Please view the presentation from the meeting and send any feedback using the comment form on this page by Feb. 7. Update - 9 Feb 2017: See the Fairfax Connector article on the public meeting. FCDOT will be holding a community meeting tonight, Monday, 6 February, 2017, in the cafeteria of the Lake Braddock Secondary School at 9200 Burke Lake Road at 6:30 p.m. The meeting will begin with an open house and an opportunity to review information and talk to FCDOT staff the Braddock Road Widening Project and Multimodal Study. 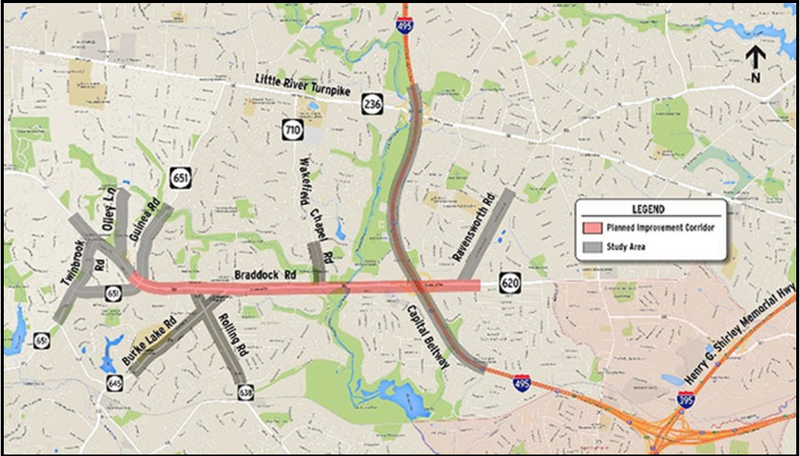 At 7:30, the Braddock Road Task Force will present recommendations for improvements to Braddock Road from Guinea Road to the Beltway. These will include options to connect all of the trails and to run mixed use paths down both sides of Braddock. The meeting will conclude with time for questions and answers. This is an important meeting for bicyclists and others interested in improved multimodal transportation options in the Burke area. Please try to attend.